The Furniture Physicians Company is a family refinishing business operating in the Columbus Ohio area for its' 34th year. Darrel and Annette Kestner with their daughter Lora and staff offer you over 110 years of combined stripping, repair, and refinishing expertise. Wooden Furniture Restoration is our specialty although we also offer Metal Stripping, Brass & Copper Stripping, Polishing, & Lacquering and Refinishing & Repair Supplies. Our in-home and on-site services include repair and touch-up. We are also available nationally for restoration consulting and planning. Furniture Physicians is the largest restoration shop in central Ohio and 3rd largest in the United States. If you need help immediately call us at (614) 855-9720. "We can restore the irreplaceable." The furniture you own, just inherited, or are thinking about refinishing or repairing is an important part of history. It's probably made of better material (real woods and wood veneers) and was crafted to be durable and serviceable for many years. If you have bought new furniture in the last 20 years you have seen this is usually not the case. Most new furniture is made from ground paper and wood pulp with an ever thinning wood veneer and construction techniques that are questionable at best. Use of plastics is at an all time high. Although newer furniture is somewhat serviceable it can be more expensive to repair than your older quality constructed pieces. Good refinishing brings back vibrant original colors and showcases the wood under modern more durable coationgs that offer beauty and protection. Quality structural and cosmetic repapir can economically put a piece back in service that may have been otherwise discarded. Restoring makes sense environmentally too since the furniture restoration process uses less than 10% of the energy and natural resources that are required in new manufacturing. Sound interesting??? Find out more about our exclusive services, restoration process, and FREE ESTIMATES. Why go with Furniture Physicians??? If you are shopping for these restoration and conservation services you'll find few companies that have both an A+ rating with the Columbus Better Business Bureau and a top rating with Angies' List. You will also find us listed with The American Instiute for Conservation of Historic & Artisctic Works as Wooden Artifact Specialists. Our ability to do conservation work means we have a higher skill set and more informaion to help us with your project. I was sitting at my large oak harvest table the other day and noticed that the angle of the sun was changing as it spread through the afternoon. I brought in some sample defect boards that I use in demonstrations.... wow, the sun was highlighting even the smallest of defects. Now that the time for "spring cleaning" is upon us, I have gotten many calls on all types of table tops. I can see why now.... from about noon on, if you open your drapes it's like throwing a magnifying glass on a table. Need some help with that??? Check out our in-home service area by tapping that button up on the left of this page. If you need to find out more about your next project quickly just tap on the Can You Afford to Restore button on the left and we can answer you back by email or phone in 24 to 48 hours. IMPORTANT- If you are dropping off or picking anything up at our shop you MUST call ahead and make an appointment with one of us. We are all working on flex schedules and also are on the road now to reduce labor and handling costs within our company. By doing this we have kept our pricing at 2006 levels to help you in this rocky economy. Just call Lora at 614-855-9720 if you need to see us. This service is available in central Ohio and surrounding areas with FREE ESTIMATES. Mr. Kestner also services special jobs almost anywhere in the United States. Information by phone or fax along with pictures and descriptions are useful in putting your estimate together. Only travel expenses are added to regular rate quotes. Many out-of-state customers use Mr.Kestner because of his 34 years of restoration experience and extensive educational background. Beyond his formal college education at the Ohio State University he also did his college work study in the Conservation Department of the Ohio Historical Society. He has over 5000 hours of repair and refinishing training with Star, Mohawk, Restorco, and Minuteman Restoration Schools nationally. Mr. Kestner has 2 years of training specifically targeted at the repair of new furniture. Locally he has taught at the Woodworkers’ Store in Columbus, Ohio for 11 years and also at Woodcraft in Hilliard, Ohio. He has also done several call-in restoration advice shows with New Albany’s WCVO radio. His services are available through our regular Furniture Physicians phone (614)855-9720. Because we have been doing so much touch-up work lately I thought I would give you some of our most frequently asked questions and how we handle the work in your home or office. Well, that depends, if you compare it to the cost of buying new furniture or totally stripping and refinishing an item, then the answer is no. In fact it only runs about 10 to 30% of the original purchase price of the item. Most of this work can be done in place saving pick-up and delivery costs as well. Now if we are talking about poorly made furniture that you paid too much for in the first place and you expect us to save its' failing coating that can indeed get costly. If I have you do touch-up will the furniture look like new? No, I might be able to get you to 90 to 95% of the look before the damage was done however the owner of the furniture almost always remembers where the damage was so a "like new" repair although possible is rare. I have a dresser I was thinking about having touched-up. What do I do? Simply call our main 614-855-9720 number and schedule a free in-home estimate. If the price is ageeable sometimes we can do the work right then if its' minor or schedule back when we are in your area again. When we come in to do the work we will pick an area, touch it up, and let you see how you like it. This is our free sample before beginning the rest of the piece. Our guarantee to you is that if you do not like the sample we will stop, remove our work and leave with NO CHARGE to you. We feel this is a fair policy when it comes to touch-up as some people have much higher expectations than we or THEIR furniture can deliver. If you like our sample we just continue to do the work. Payment is expected when the work is completed. Because of exhorbitant credit card charges on our in-home work we can only accept checks and cash. Your personal or business check is welcome. Large orders can require a deposit before scheduling. At Furniture Physicians refinishing can be separated into several distinct services so consumers may choose only the process they need. This can allow some hobbyists to share in the restoration or you can simply have us do all of the services listed below as needed in your particular project. 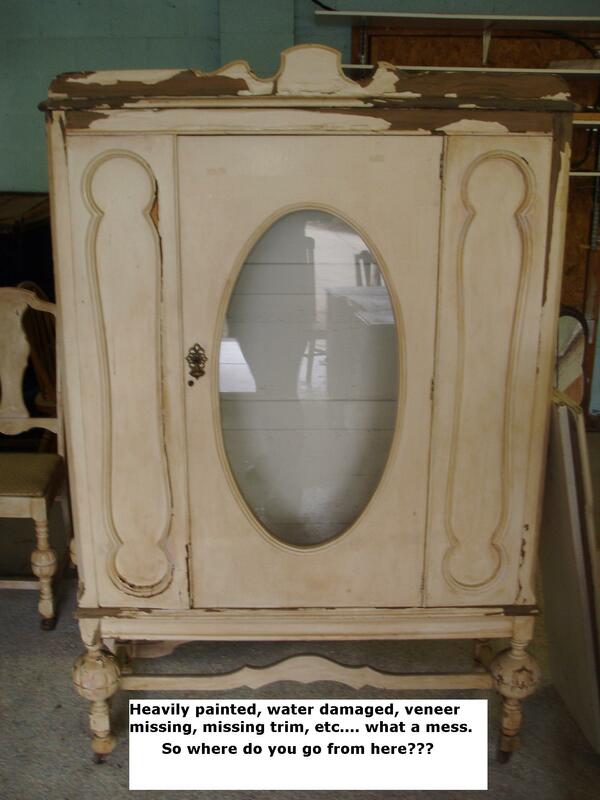 Furniture stripping is the first step that is usually done in a total restoration process. We determine first if this is necessary. Sometimes this should not be done because of historically significant coatings or repair of the coating is needed instead. (See Repair below.) From hand stripping, sanding, flow-over, or quick chemical immersion methods we can accommodate budget and quality without compromising glue joints or thin veneers. Our stripping also includes pH adjustment and application of sizing agents. These last 2 steps will make a new stains and coatings last longer (laboratory and exposure tests show up to a 400% increase) and apply more evenly. We are also one of the few companies in central Ohio that still remove paint from furniture. Many times people assume that refinishing must always involve stripping. Cosmetic repair is repairing the stain or coating rather than stripping it off. Sealers, fillers, conditioners, and color are sometimes all that is needed to retrieve much of the original luster of the piece. For furniture that would lose special effects old coatings in stripping this is the only way to preserve them. The field of wood restoration overlaps into some specialties that you may find useful for a variety of projects around the house or business. From yesteryear's fragile French Polish finishes to modern tough catalyzed coatings we can protect your heirlooms. Our standard finishing process includes the stain color of your choice with 4 to 6 coats of tough environmentally friendly coatings. From dull to high gloss we can very the look without affecting the durability of the finished product. Our artistic skills, experience, and technical expertise combine to give you a beautiful finished piece of furniture. Another feature of our coatings is their "patchability" if damaged. 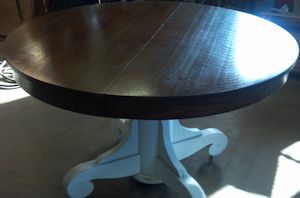 No matter where you move any competent restoration professional can easily touch-up your refinished furniture. This is a new term to most consumers but nothing new to quality restoration shops. We have always offered this service when a piece can and should be done this way. Refurbishment usually consists of cleaning the existing finish, minor touch-up of nicks, scratches, gouges etc., and the application of a few more thin layers of new matching coating. The thin layers of new coating actually will "melt in" with the original coating. We would like to stress that it is the condition of the piece itself which dictates if this process can be done. 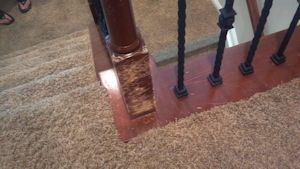 Many coatings have lost so much of their original ingredients as well as evidence of more severe types of damage to the wood can easily prevent this type of restoration. We can however do some testing on your furniture which will tell us if this is a possible treatment. We have seen many examples of poor refurbishment over the years which seriously damages the value of the pieces. Are you looking for a new or custom look? Furniture Physicians offers black, white, and mocha laquers. Update your entire piece in one of these stunning effects or try a two tone or "cut back" effect. It's easy to get a free estimate on your refinishing or restoration project. Just pick up the phone and call our main number, (614)855-9720. A "rough" phone quote can be given to you based on your description of the furniture. All phone quotes are finalized in writing before any work is done. If you are in the Columbus or nearby surrounding areas we also can do a FREE in-home quote for you. Bringing or shipping a piece in from distance? Just take a few photos of the item, and some measurements of overall size, and drop them in the mail. You may also just tap on the Can You Afford to Restore button on the left and someone will give you answers, pricing, etc., in 24 to 48 hours. We can then e-mail, call you and/or fax a quote to you. Since we've restored over a quarter of a million pieces of furniture over the years we've probably worked on a piece like yours before! It takes an 80 year old tree to make just 4 T back chairs; another to make the table. An average tree will yield 161 board feet of lumber and only will be furniture grade. On the average, there will be about 12 trees per acre that are ready to harvest. When you think of all the labor, processes, waste, pollution, energy, destruction of wildlife habit, transportation cost and packaging to make, sell and deliver a new piece of furniture, companies like us have a very positive impact on the environment by recycling furniture. The paint removers, the finishes, the labor to refinish easily have a 97% less environmental foot print when compared to new. Much of the furniture that comes to us is put back in daily use in homes. A broken leg or drawer must stand up to this use. Since our records indicate that less than 1/10 of 1% of our repairs fail we can offer you this unique limited warranty. Limited Repair Warranty- If the structural repair we have done fails do to our poor craftsmanship and does not show signs of abuse or excessive wear and tear we will repair the area for a second time for FREE. Warranty claims are honored with your original receipt (work order) presented along with the re-work. (This warranty does not cover the tearing of surrounding woods because our repair did hold.) Furniture Physicians reserves the right to turn down a repair or offer, at the customer's own risk, non-warranteed repairs. Veneer is the thin layer of wood many times glued over solid wood stocks and other materials. The veneering process is centuries old and originally was done to obtain particular cuts of decorative wood. Veneering use extends into most kitchen cabinets, automobile dashes, paneling and trim, and many other areas where you "think" you might have solid wood stock. We can always tell you if a surface is veneered and what we can do to repair it. In most cases it has evolved into a method of cutting costs and expending the use of many hardwood trees. 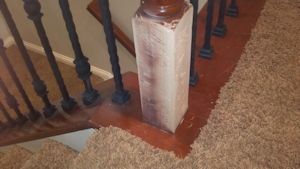 We are often asked about replacing or repairing this thin surface. 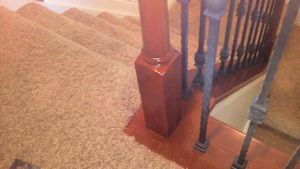 When veneering is chipped or completely removed from a surface it is necessary to repeat the construction steps and match the wood species and graining textures to replace it. With our current technology and materials we can provide excellent repair of missing areas or chips of veneer.We do however try to avoid whole sheet replacement if possible. New veneers just don't match the look of older veneers and many times connot lay perfectly flat unless applied by a process called "vacuum bagging". We do have another veneer specialty company that we recommend locally if you need that service. Just call our main Furniture Physicians Co. number for that infromation. 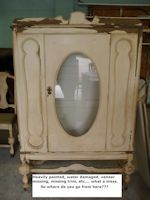 Many old pieces of furniture have lost some of their "carving appliqués." These were carvings made of solid or even compressed wood, cut out separately, then glued and wire nailed to the surfaces of the furniture. 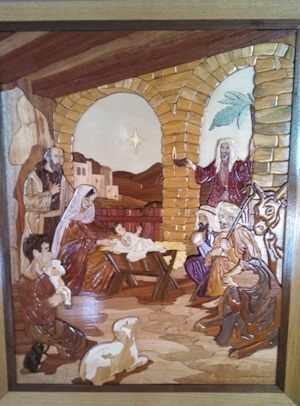 Over the years the glue fails or the carvings catches on the edge of something during a move and are lost. Many times these were Bendix style carvings (compressed wood cutouts). The die cutters in many cases have survived and we can get these carvings very reasonably through our suppliers. What about missing solid carvings??? It's a little more complex but in this case we can usually do re-casting. Since these pieces of furniture are fancier to begin with the carving pattern may be duplicated somewhere else on the furniture. We use a special theatre grade latex compound to take a "mold" of the duplicate area. We then can use a combination of epoxies and fiberglass materials and cast the missing part. Color and even strengtheners can be cast into the new carving replica for exacting looks and great durability. No one but the owner of the piece will know that it has even been replaced! While similar to carving replication, parts replication can be a little more challenging. This may involve casting a duplicate of a missing wooden knob, a decorative brass key plate, or even part of a fancy turning or trim block from a bed. Using a multi-dimensional molding process, the mold is most often broken into two halves using alignment pins for reassembly. Sometimes the part can even be cast directly back into place with steel pins or screws providing an anchor into the wood itself. In most cases your parts replication is only limited by our imagination! Wrought iron, cast iron, steel, aluminum, and many other metals can be stripped. Just call us with a description of the piece and a phone quote can be given to you. Brass, copper, pewter, and many fine metals can be stripped, polished, and lacquered by our shop. Much of this is done by hand and machine methods. These items are difficult to quote over the phone and may require an in-shop inspection before an estimate can be given. We carry the best in refinishing & repair supplies. Many hobbyists will prefer to do their own finishing or repair work. Names such as General Finishes, Restorco, Mohawk, and of course, Furniture Physicians Co. brand products are not found in your local hardware stores. Finishes, glues, polishes, and sandpaper are few of the items we sell to our customers. We even have our self-produced finishing video that can be rented to aid in your project. Can You Afford to Restore?